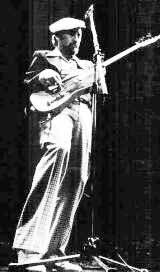 >Roy Buchanan's musical career began in the tiny town of Pixley, California. His father was a farmer and Pentecostal preacher and Roy's first musical memories were of racially-mixed revival meetings his family would attend. "Gospel," he recalls, "that's how I first got into black music". Late night R & B radio shows also helped whet his appetite for blues-based music. But the music played by the folks in Pixley was country, so when the 7 year-old Roy first expressed interest in the guitar, his parents sent him to the local steel guitar teacher, Mrs. Pressure. Within weeks, he was picking out the Hit Parade favorites on steel guitar, spurred on by his teacher who, Roy remembers, would cry every time I made a mistake". Roy's musical career took him from underground club gigs in the sixties and seventies to national television, gold record sales and worldwide tours in the eighties with the likes of Lonnie Mack, the Allman Brothers and many other blues/rock guitar icons. Buchanan died in Virginia in 1988. He was 48 years old.